Just bought a 2009 EX9.9 26" from a close friend for $400. Im well aware of the deal i got, but it did come with a small catch: the mouting point where the frame and the rear suspension mechanism meet is worn out creating some play. I was initially told it was the pin that was worn out. after having a shop check it out, turns out it was the actual frame that was wearing down. The guy said he can fix it for $80 and it would hold just fine. he said its some adhesive stuff from 3M that he uses. anybody ever heard of such a thing, and would you trust it? Do you have a picture of the affected area? Is the wearing on carbon, or on a metal bushing? In most cases that I'm aware of, carbon fiber can be repaired. I can't attach images from my phone but if you can see my album, it's the most recent image. Ok now I'm waiting for this to turn into a phishing scam. I wish I could say I was clever enough to pull off a scam, but afraid I'm just an average guy who came upon a great deal whilst looking to replace my hard tail that was stolen while I was still living in Miami. My good friend whom we'll call 'Ben' was giving me advise on some bikes I was looking at, he then sent me a Craigslist link on his bike he was selling, he told me he'd give it to me for $400. My wife will be in Miami in two weeks and she will bringing it back. in the meantime it's hanging out at a buddies shop. so, to clarify: I bought it from my former hometown while living abroad. I don't need help transporting it, all logistics have been sorted out. I was simply asking if anyone has heard of this 3M stuff used to repair carbon frames or would trust it. After new rims, repair and tune up the Bike was approaching $1000. Still a killer deal for a FS. My good friend whom we'll call 'Ben' ..
Is that not his real name? I call him Ben, not his real name. Yeah, deviates him. Any other unrelated questions? OK first, your rear triangle is aluminum, not carbon. If there is play where that pivot bolt interfaces with the aluminum chain stay, I think that would not be fixable but I could be wrong. It would require a new bushing which would need to be custom machined and then bonded or welded in there. That's a lot more than you paid for the bike. 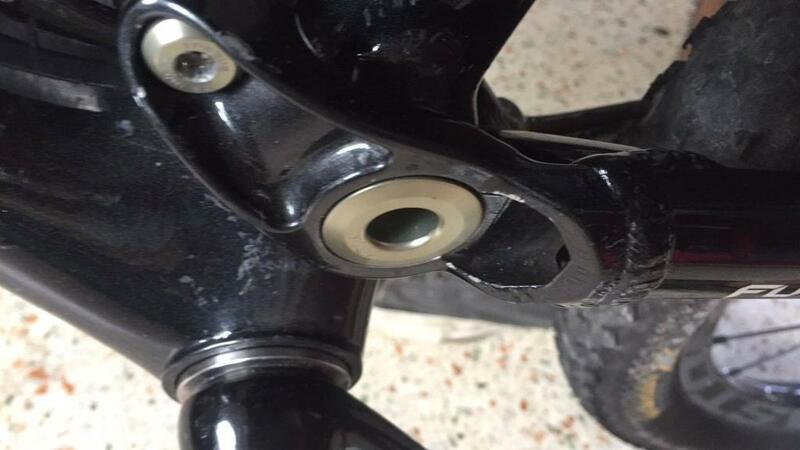 If the surface between the chain stay and the main triangle is worn, there is probably a metal bushing on the main triangle which is bonded inside the hole in the carbon for the main pivot bolt. This would serve as a contact surface between the rear triangle, the bearing, and the main triangle. Also expensive to fix. What I would do in that case, since you paid $400 for it, is custom machine a thin washer at the correct diameter to go between the chainstay and the main triangle. Either way what you describe is not a tradition carbon repair, usually when folks talk carbon repair they are talking about fixing a section of damaged tube, this is different because it's a contact surface under high stress and friction (because, it's at the pivot). So if the shop told you "$80 and 3m," I'm perplexed what he's doing. Cracked All mountain frame worth repairing? Repairing GT Force Carbon pivot sleeve separation?